Today i'm going to talk about a FUN argument that I'm sure you all soap-addicted people heart: MOLDS! So far I've only made big soap bars, cutting them in bar-slices after. Then I discovered the fun world of the molds: tons of super funny molds were there on e-bay and on other web sites ready to be purchased! I definitely fell in love with the massage bar molds (already purchased, I'm waiting for the UPS man as a kid waits for biscuits ^___^). Herbal Accents : soo many molds! Also 3D molds! Soap Place : their molds are so cute! They have massage bar molds in stock. As usual,if I'll found other interesting sites for molds I'll update this post! If anyone knows other good sellers,please leave a comment!! I'm so excited I have to write this!! Last night I had my very first sale on Etsy! !This morning I labeled the pre-packaged soap bars and went to the post office to ship them. I packaged the soap bars before in a foil of clean white thin paper,than in a foil of brown paper. Then I labeled all. So,why don't we talk a little about how we package and label our Items?? I'd like to know how you guys have organized your work and what paper/colors/ribbons/supplies you use! Good morning! How did you pass Xmas day? Hope everything gone right. I woke up this morning thinking about what to talk about in my "today" post on the blog; I decided to talk about melt & pour soap base. When I decided to start with soap-making, I tought that melt and pour was the right technique for me. This because I have a small lab (inside my house where I live with parents,sister and my kitty); I read a lot about soap making with lye and I definitely got scared of hot/cold soap making process. Once I decided for Melt & Pour, obviously I had to find a good-natural-clear base with reasonable costs (and shipping costs). It wasn't easy! There are only a few web sites selling this kind of base in bulk quantities,and many are soooo far away that shipping costs for me were going to be higher than soap cost! I want to help people who's starting soap-making , so I'm going to list here the web sites I've found! - Gracefruit.com This is a very good site for soap makers,expecially for european ones: in fact it's in the UK and shipping costs are definitely reasonable. 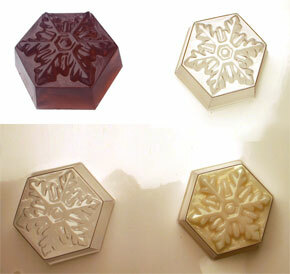 It sells white soap base and clear soap base in bulk quantities. It sells also scents,oils,additives and everything you may need. - PudledukSoapCo.etsy.com They make a very good white soap base all natural and super fatted with Shea butter. Their base is actually a made to order cold processed soap so it is just like you mixed the lye and fats yourself. The nice fact is that they can make custom orders with your favourite quantity! - Wholesale Supplies Plus 15 kinds of soap bases, many are already enriched with milks and butters. They are in Ohio so shipping costs are reasonable for U.s.
- BrambleBerry.com Thank's Kelle for talking me about this beautiful site! They sell tons of supplies and tested bases! Many Etsy soap sellers use their bases. If I were you I wouldn't buy base from E-bay: my advice is to buy always from web sites which certificate that their soap is good for skin and that the base have been clinically tested. If I'll found other interesting sites selling bases I'll update this post! Hi everybody! Welcome to my blog! My name is Francesca, I'm an Italian 21years old student of Landscape Architecture. I live in north-west Italy, on the see. I stated with this craft hobby a few months ago, making some soap bars for me and my family. Then I never stopped: I read books about the properties of the erbs/oils/butters,bought essential oils and fragrances, bought bottles and jars for body waters and scrubs....I had to buy tons of supplies (and it costed a lot) but the money I spent was NOTHING in comparison with the satisfaction of creating a good line of products with my name. I created this blog not only as a showcase of my products,but expecially to make all the people interested in soap making partecipate my creative work. There will be tutorials and advices. There will be lessons and recipes. So,what can I say,bookmark this blog and follow me in the faboulous world of soap! I'm trying to make some money to rent a small lab for making my soap and improve my business. If you like my work or my tutorials helped you some way,please donate =) Thank's sooo much to everyone will donate! I took the handmade pledge!